In an effort to promote respect for human rights and put in place an increasingly comfortable workplace, the Nisshinbo Group engages in human rights education and training activities based on a human rights education and training promotion structure chaired by the chief of the Corporate Strategy Center (vice president of the Company) and with the senior manager of the CSR Department as sub-chair. With respect to the Group's internal education and training, we conduct a variety of systematic programs, including training for new employees and training for all employees throughout the year. To raise employee awareness of human rights, coinciding with Human Rights Week in December each year, Group companies in Japan and other countries invite employees and their families to submit human rights slogans. To prevent harassment, we have set up harassment advice desks at each subsidiary in Japan. In principle, these desks are managed by two or more male and female staff, and training is provided to newly appointed managers to increase their skills in advice. To promote respect for human rights throughout the supply chain, we have in place the CSR Procurement Basic Policy for the Nisshinbo Group, as well as CSR Procurement Guidelines for each subsidiary, which clearly state our stance on awareness of fundamental human rights and the prohibition of child labor among other things. The Nisshinbo Group has been conducting anger management training since fiscal 2017. Spreading from the United States in the 1970s, anger management is a form of psychological training that teaches one to control his or her anger. 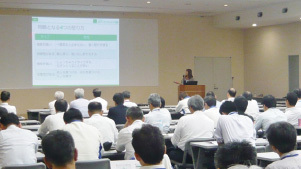 Recently, this training has also spread to employee training programs at Japanese companies. We first conducted anger management training at the management level for all business sites in Japan and about 1,000 managerial staff have received the training. Many trainees indicated that it had been a good opportunity to face their own anger. The Company has high hopes for the training as a way to foster good communication and prevent power harassment through proper emotional control. In the future, we plan to expand this training’s target range.